NEW INFORMATION ON PAGE 5 ! ! Note that at the time of this publication a contract had been signed between Mr. A. 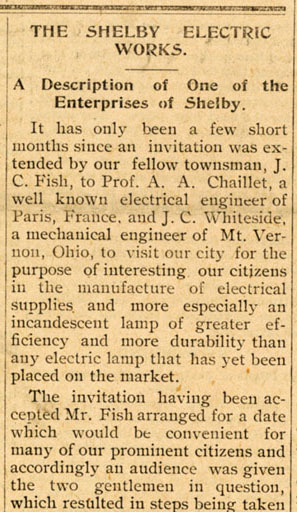 A. Chaillet, Mr. J. C. Whitesides both of Columbus, Ohio, and W. W. Skiles, G. M. Skiles, M. H. Davis, J. C. Fish and Jonas Feighner, who were all to become officers in a newly formed company to produce "incandescent electric lamps". The article states "Mr. Chaillet . . . explained his part of the business and answered all questions . . . concerning the past and present electrical inventions and satisfied those present that his proposition is fair and well worth a trial." John Chamberlain Fish was born in Sheldon, Franklin County, Vermont on April 14, 1864. Sheldon, Vermont is located approximately 10 miles south of the Vermont / Quebec border and not far east of the northern end of Lake Champlain. His parents, Cortez F. and Hellen Carlisle Fish were both born in Vermont and were living in Sheldon at the time of the birth of their first two children, daughter Frances and son John. By the time of the 1880 Federal Census Cortez F. Fish and family were living on High Street (East Main Street) in Shelby, Ohio. Cortez had been a mill operator while living at Sheldon, Vermont and continued his trade while living in Shelby. 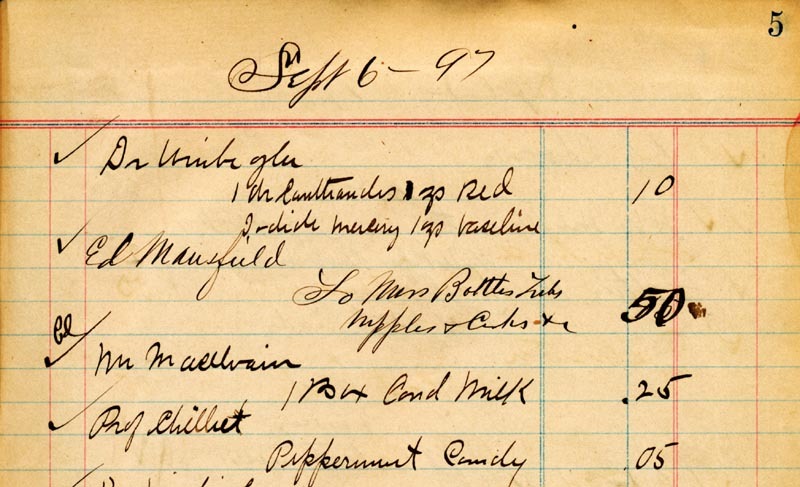 He listed his occupation in the 1800 census as "Merchant Mill Flour". In the household were: C. F. Fish age 56, Hellen age 44, John C. age 16, C. F. Jr., age 8 (born Ohio). Cortez Junior's age and birthplace indicates that the Fish family moved to Ohio prior to 1872. The 1900 Federal Census shows that John C. Fish has married ( March 02, 1892) and his family is living at 19 South Broadway (now Mansfield Avenue). John C. Fish was born April, 1866, age 34. married 8 years, born in Vermont, father born in Vermont, mother born in Vermont, John's occupation was listed as "Manager Elect ??" and he owns his home with a mortgage. Anna May John's wife of 8 years was born Jan., 1877, in Ohio, age 33, her father was born in Virginia and mother in Pennsylvania. She is the mother of 3 children, all of whom are living. DeForest R. Fish son of John and Anna was born Oct., 1893 in (Shelby) Ohio, age 6 years. Cortez C. Fish son of John and Anna was born July, 1896 in (Shelby) Ohio, age 3 year. John C. Fish son of John and Anna was born Nov. 1899 in (Shelby) Ohio, age 1 year. This home has an interesting history. It was built in the 1860s by Thomas Mickey who gave it to his daughter Sarah Roberta after she married Franklin DuBois (in 1867) who served in Co. A of the 12th Ohio Cavalry during the Civil War. 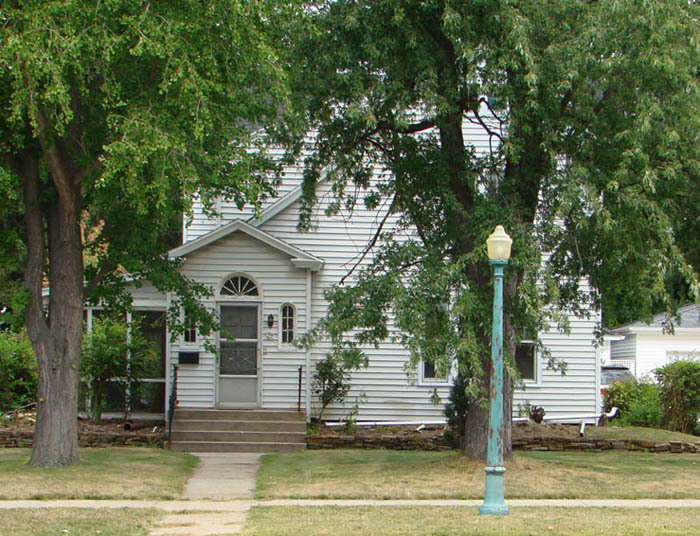 He and his new wife were living in the Mickey home on South Broadway at the time of the 1870 census. By 1880 they were living there alone with four of their five children. Thomas and wife Rebecca had passed away several years before. 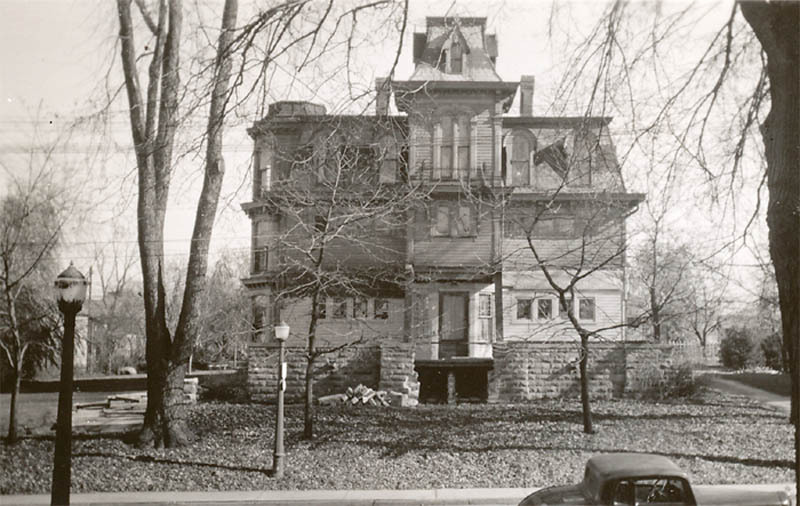 In the early 1890s, Frank, Sally and their family decided to move to Kansas, and the home was sold and became "The Pennsylvania House". Shortly before the 1900 census, John C. Fish bought it for a family residence. The Fish home occupied the lot where the old Mutual Insurance building is now located. John's wife Anna May continued to live in and up-grade their home until her death in 1939. More on the John Chamberlain Fish's family later. Not much is known at this time about Adolphe Chaillet's early life. The first piece of documentation known at this time is a copy of a manifest of the H. M. S Teutonic that sailed from Liverpool and Queenstown to the Port of New York. The Teutonic's master, Peter John Irving signed the manifest on December 10, 1891. 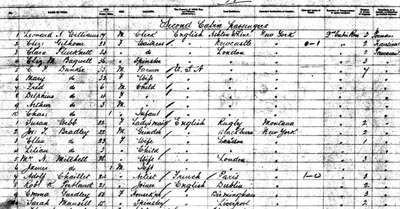 The manifest indicates that Adolph Chaillet, age 24, listed his occupation as "artist" and also indicated that he was French and his last residence was Paris. This voyage became quite significant to Adolph Chaillet even before his arrival in New York. On board for this voyage was Ellis W. Bickmore who was part of the Teutonic's crew. Ellis Bickmore born 1844 in St. George, Maine, a son of Henry Bickmore a Master Mariner and grandson of Samuel Bickmore also a Master Mariner, had become a sailor prior to 1870 and by 1900 was ship's captain. Ellis and Adolph Chaillet became friends during the crossing and after arrival in New York, Adolph was invited to visit the Bickmore home in St. George's, Maine. Ellis and wife Catherine Wall Bickmore were parents of at least six children, two sons and four daughters; the youngest daughter, Maud L. Bickmore, was 15 years old at this time. During the following year or two, a relationship developed and Adolph and Maude were married, probably in 1894 or early 1895. They were soon afterward living in Columbus, Franklin County, Ohio. Above is a link to the Teutonic's ship manifest. An article included below (The Shelby News - June 25, 1897) states that: "Mr. Chaillet came to this country in 1892 to manufacture lamps at Marlboro, Mass. . . . The professor was then engaged in the designing department of the General Electric Company in Lynn, Mass., and has recently completed the design of an electric locomotive for The Jeffreys Manufacturing Company in Columbus, Ohio." The Jeffreys Manufacturing Company designed and manufactured mining equipment, generally coal mining equipment at that time. Richland County Courthouse documents indicate that Adolphe Chaillet purchased the Boulevard home (lot 1103) from Elmira K. and Elver L. Williams March 22, 1899. Lot 1103 now corresponds to house number 27 on the Grand Boulevard. It has not been determined where the Chaillet family was living the first several years after their arrival in Shelby until the home on the Boulevard was purchased. 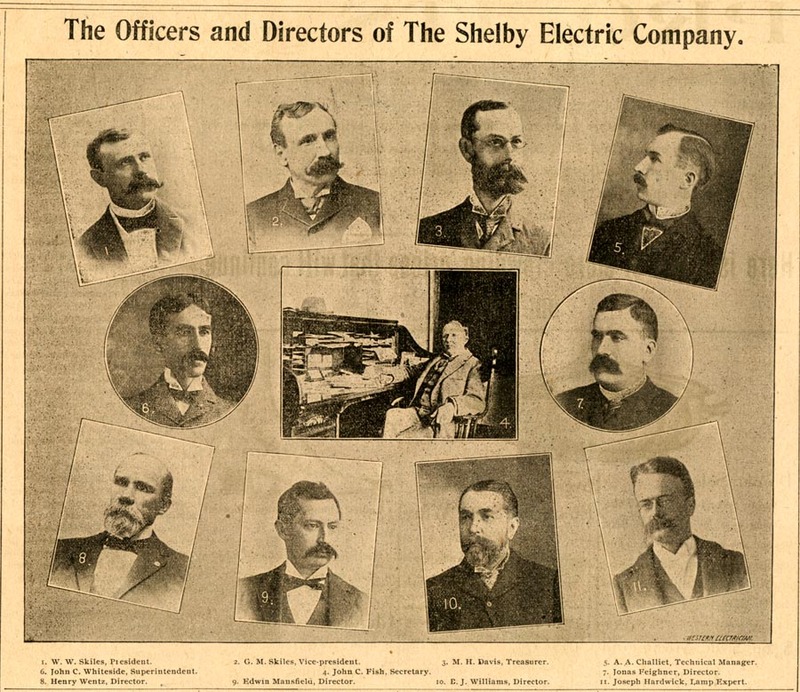 The early inception of the Shelby Electric Company dates back to the early summer when J. C. Whiteside, superintendent of the company casually mentioned to J. C. Fish, the discovery which Mr. Chaillet had made in the incandescent lamps and the claim made for the lamp by the discoverer. Mr. Fish became interested at once, recognizing that if the lamp sustained the claims put forth in its behalf, its manufacture would prove one of the most remunerative investments in the country. This company was organized last August (1896) with a capital stock of $100,000. There are about 50 local stockholders, nearly every dollars worth of stock being owned here, which is ample testimony that the people of this community are enterprising and imbued with the spirit which has brought our present magnificent civilization up to its present standard. 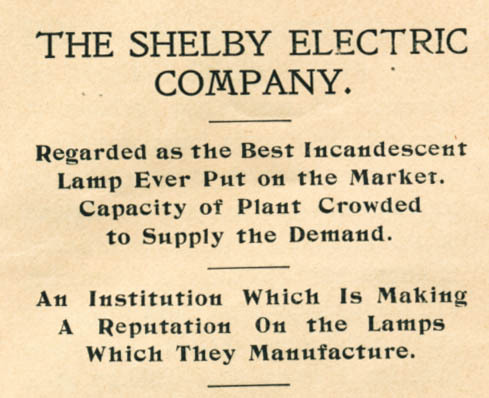 The manufacture of the Shelby lamp was begun February 1st (1897), and since the works were started the capacity of the plant has been taxed to the utmost to meet the demands. The fame of the lamp has preceded its manufacture and intending purchasers were anxious to test the efficiency of the lamp and the claims put forth in its behalf by the managers of the institution." "The factory has many special machines designed especially for them which very largely aid them in turning out as perfect a lamp as it is possible to produce. The technical part of the work is in the hands of Prof. A. A. Chaillet, the inventor of the lamp which bespeaks for the future of the institution a reputation second to none in the character of the wares and their utility. The claims for their new lamp are such that no one who is at all conversant with electric lighting will fail to grasp the full import of what the system really means, not only to the individual user but to those who have embarked their money in this enterprise. 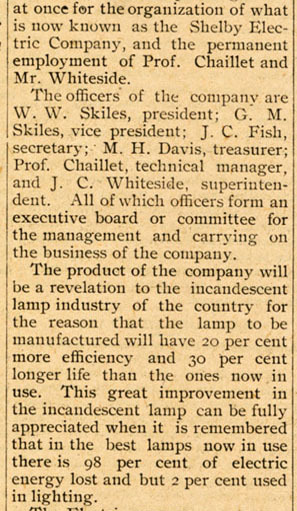 It is claimed and proven by practical experiment , that the new lamp will give 20 per cent greater efficiency with a life 30 per cent longer than the lamps now in vogue. This means that electric lighting companies throughout the world will save one half of their present outlay for lamps - while to the consumer it means a third longer life without extra cost to either the consumer or the lighting plant. The lamps which will be manufactured will cost a trifle more to build, and may cost a few cents more to the consumer, but the vast difference between the lamps which this company will manufacture and the lamps now in use, makes the difference in price a mere bagatelle. 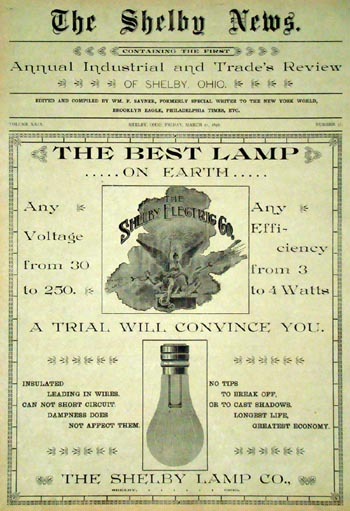 Last January (1897) tests were made of the Shelby lamp in conjunction with other lamps. The lamps selected to be tested with the home lamp were the best made and the results were truly astonishing. 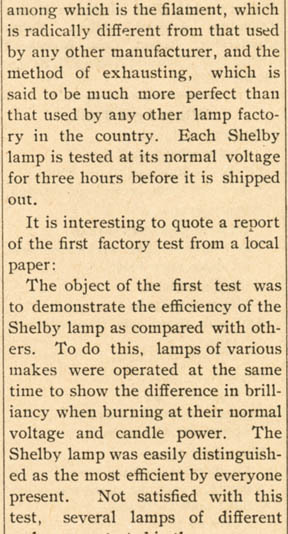 The first test was to demonstrate the efficiency of the Shelby lamp as compared with others. To do this, lamps of various makes were operated at the same time to show the difference in brilliancy when burning at their normal voltage and candle power. The Shelby was easily distinguished as the most efficient by every one present. Not satisfied with this test, several lamps of different makes were tested in the same manner, in order to select the most efficient lamp to compare with. The most brilliant of other makes having been determined, it was selected for comparison with the Shelby lamp. The result of the conclusion of this test was watched with great interest by all present, and much to the satisfaction of those interested. 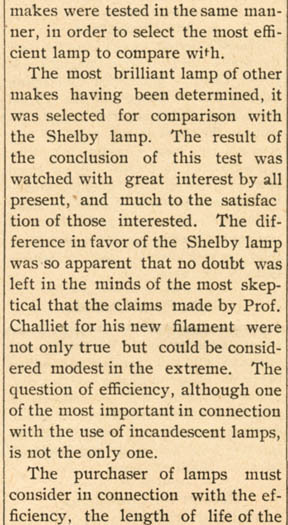 The difference in favor of the Shelby lamp was so apparent that no doubt was left in the minds of the most skeptical that the claims made by Prof. Chaillet for his new filament were not only true but could be considered modest in the extreme. The purchaser of lamps must consider in connection with the efficiency , the length of life of the lamps he buys, as it is perfectly possible to burn lamps at so high an efficiency as to materially shorten the life thus making the lamp uncommercial. 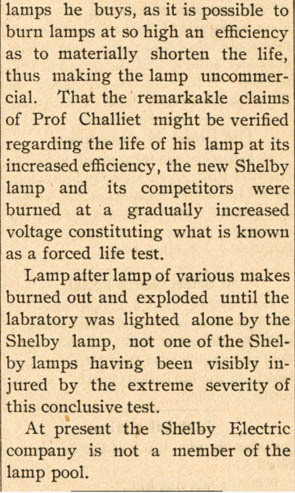 That the remarkable claims of Prof. Chaillet might be verified regarding the life of his lamp at its increased efficiency the new Shelby lamp and its competitors were burned at a gradually increased voltage constituting what is known as a forced life test. Lamp after lamp of various makes burned out and exploded until the laboratory was lighted alone by the Shelby lamp. Not one of the Shelby lamps having been visibly injured by the extreme severity of this conclusive test. 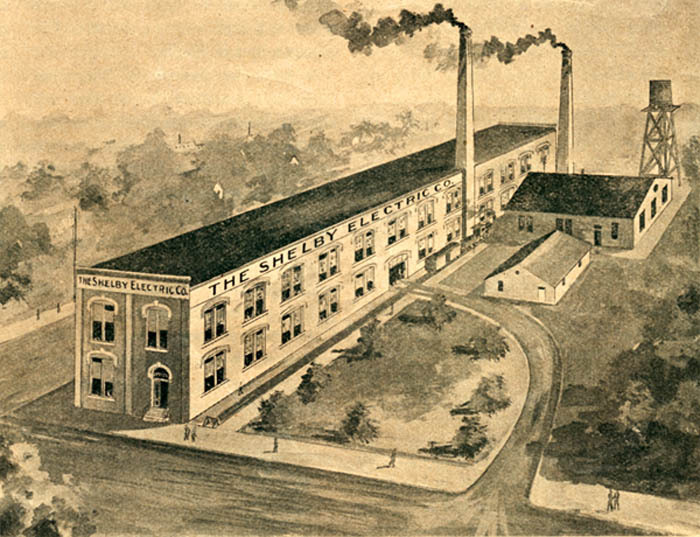 The exterior of the Shelby Electric Company as it appeared as an artist's conception drawn during this period of the company's development can be seen above. The company had purchased three acres of land bounded on the south by Tucker Avenue and on the east by the B & O Railroad tracks and on the west by a newly built section of High School Avenue. The property to the north of the Electric Company's property would one day be owned by the Shelby Printing Company which later became the Shelby Salesbook Company. The proximity to the railroad was important as a means for shipping their future products. Mack H. Davis 1857 39 Pres. Mill Co.
Adolphe A. Chaillet 1867 29 Electrical Eng. Joseph Hardwick 1872 24 Electrical Eng. Things were proceeding nicely for this newly formed company. It appears that the personnel and the production facilities were in place to begin the manufacture and marketing of this new Shelby Lamp in increasing numbers. 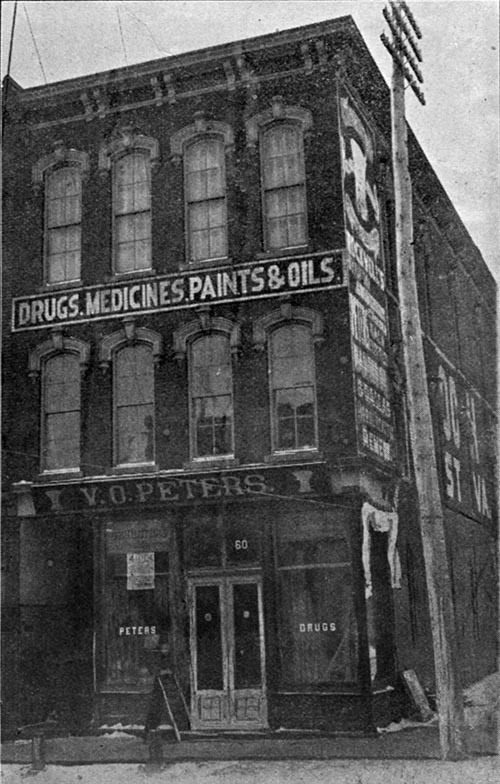 So to add a bit of human interest to this time period of our article, we browsed through a ledger that was maintained at the V. O. Peters Drug Store located at 60 West Main Street in Shelby. The ledger documents customers' purchases and payments from September, 1897 until December 31, 1899. The following is a typical partial page for September 6th, 1897. Please note that Prof. Chaillet purchased Peppermint Candy in the amount of $0.05. suppose the entry on September 20, 1897 was V. O. Peters' "Happy Headache Powders"? The above photo was taken of the V. O. Peters store as it appeared at the time of Prof. Chaillet's frequent visits. 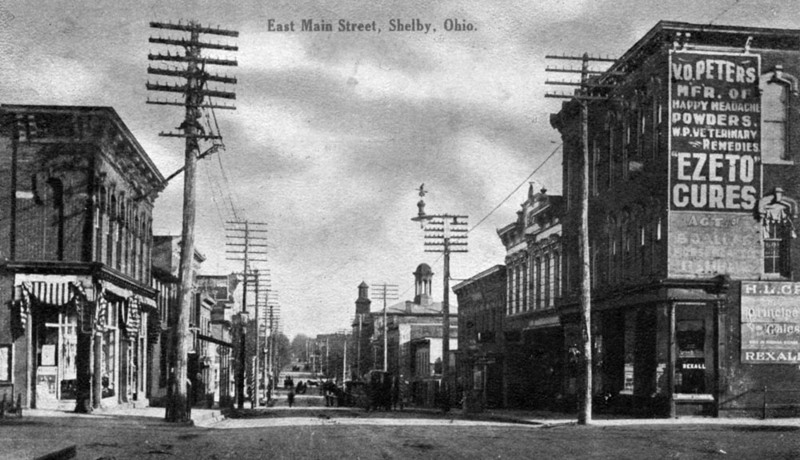 Above is a portion of a photo post card of Shelby's Main Street taken a few years after the Chaillet family left the area. The photo is mislabeled. The view is from the west side square looking east down West Main St. The Sharon Township building and the tower on the fire station behind and to the left of it can be seen in the lower center of the photo. The Peters store (with an updated sign since 1897) is on the right. 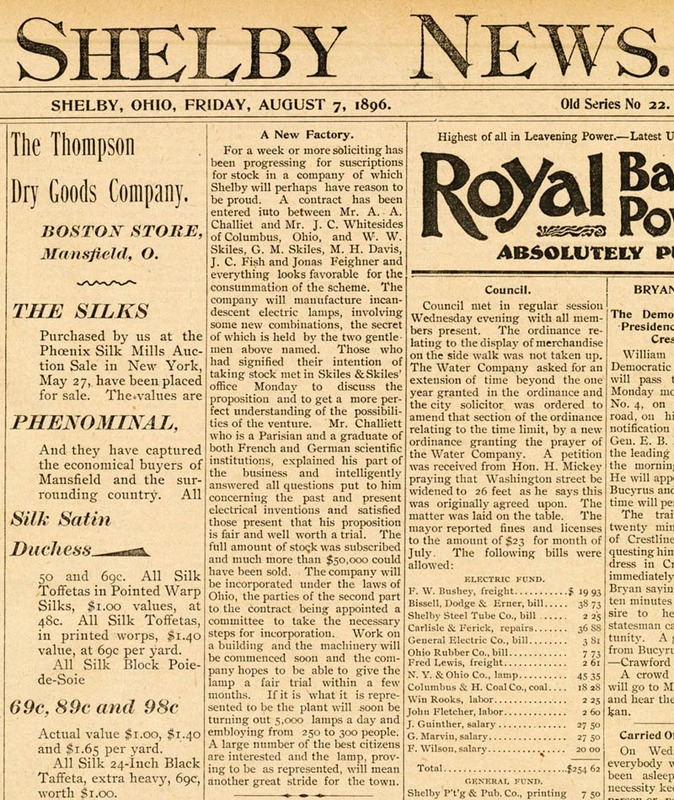 From the many previous articles it appears that the Shelby Electric Company has all the ingredients to move into higher production of Shelby Electric light bulbs and soon many workers were being employed at the growing "lamp works". This can be verified by the study of early Shelby Directories which list: name, address, and place of employment of those living in the growing village of Shelby. 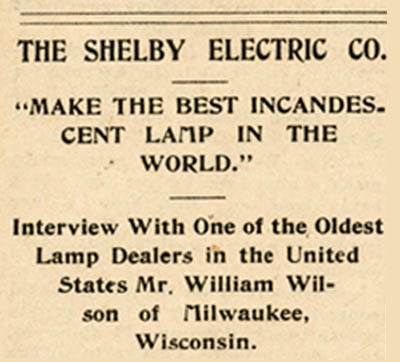 A later news article (9) confirms that in the first year of production the Shelby Electric Company sold 17,296 incandescent lamps. Copyright &COPY; 2011-2019 - The Shelby Museum Of History, Inc.